Following the ambiguous “Tulip Revolution” of March 2005, Kurmanbek Bakiev was confirmed the second President since independence with an election on July 10. He received an astounding 89% return of the vote (turnout 53%), partly based on his new political alliance with opposition leader Felix Kulov, released from prison with all charges dropped and soon appointed Prime Minister as agreed to before the election. 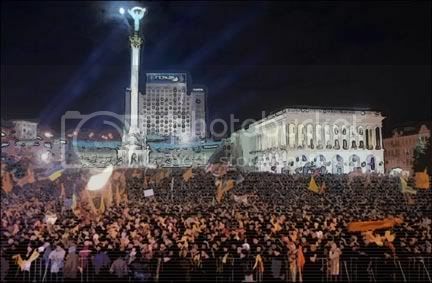 Bakiyev was inaugurated on August 14, and the old parliament agreed to dissolve, and all seemed in order: another successful Color Revolution. Erkinbayev was only in government a few months before he was killed by gunmen on September 22, in an incident widely attributed to his business dealings. Worse, this was only one of at least seven leading and controversial politicians shot dead in various incidents between June 2005 and May 2006. 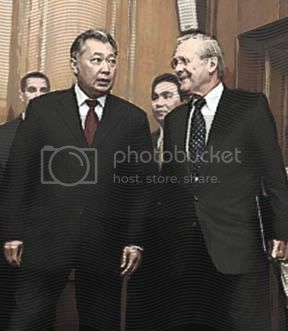 Among them was new MP Tynychbek Akmatbayev, head of parliament’s Committee on Law Enforcement, but reportedly connected to organized crime and embroiled in a long-running feud with new PM Felix Kulov. During an October visit to a prison near Bishkek to calm an uprising there, Akmatbayev and his entourage were somehow engulfed by the rebellion and he was shot dead in the chaos. There were rumors that Kulov had been involved in engineering Akmatbayev’s killing, as Byzantine as such a plot would have been. The Tulip revolution was first lumped in with the Orange and Rose Revolutions, and taken as another victory for the West. But it didn’t work quite right – the protests weren’t properly done, all the bloodshed was discouraging, and the reforms have not come. It seems the West’s Tulip Revolution was hijacked from within via Erkinbayev et al, paid off by the new government first with the ballot then the bullet to wash its hands of once useful but now embarrassing criminal benefactors. There may well have been behind-the-scenes Akayev/Bakiyev deals to stage the president’s flight to Russia to complete the drama. I sense Russia’s or China’s complicity in this episode, and it certainly would serve their interest. It would allow the SCO leaders to publicly take yet another “hit” and exaggerate the perceived extent of the color revolution campaign. This would justify their own counter-measures – which would come within weeks - while causing no real lasting change. A SCO-planned upheaval would preempt any real pro-West color revolution, as it were preventing a forest fire with a controlled burn.